At the Seven Dials Centre in Covent Garden, in a room full of students interviewing residents, I asked Kate Rich where she had lived. “I’ve lived all over Covent Garden at some point”, Kate said, explaining how often she moved homes, while always staying within the confines of the area. For a person of my generation (late twenties) that lovely square and its surrounding lanes have great charm, but between the tourists and chain shops overcrowding the old market stalls it’s hard to imagine people actually living there. During the course of my 40 minute conversation with Kate, I came to realise that there is much more to Covent Garden than meets the eye. Behind the masses of tourists and the Apple store, there is a closely knit community. Kate explained how the people she grew up with felt no need to move away to some new exciting place because they had been born in one. 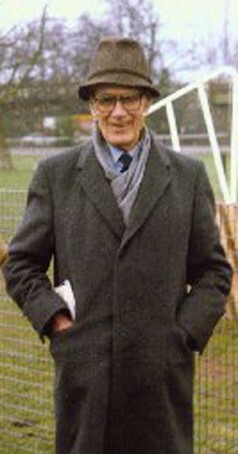 As a result, Kate’s schoolmates and friends settled in the area, having children of their own, who in turn had children themselves, making it “one of those places where you know everyone”. Kate told me how even those who were “really daring” and “dipped their toe in the waters of Bloomsbury” knew that they could “still walk back to Covent Garden” and always find an old friend in the bar of the Seven Dials Club, or a relative who hadn’t moved away. In fact, the children of families who had chosen to leave quite often applied to be re-housed in Covent Garden when they were older, “coming back to their roots as it were”. I spent much of the interview learning from Kate what it was like to grow up in the area in the 50’s and 60’s. 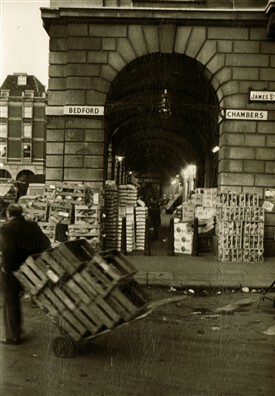 Kate’s childhood was closely connected with the centre of Covent Garden: the fruit and vegetable market. Her father was a porter in one of the shops. It was a job that was paid well, and the tips were often very generous. The shops were in effect wholesalers. Greengrocers, for example, would come to the market to buy the produce that they would later sell in their own shops. Once they had picked what they wanted from the different shops, the porters would load it up and wheel it to wherever the customer’s van was parked to help with the loading. Not everyone worked in the market, some worked in the Fleet Street newspaper printing presses or backstage at one of the many theatres. Kate said her dad made a good wage in the market, and never had to worry about buses or trains because he could just walk to work. He usually got up at 5:30 am and was at work by 6 am. He came home for breakfast at 9 am and then returned to work until lunchtime, often working later hours in the summer months when the market was busier. The employment situation was very different in the 20’s and 30’s when a job in the market was never assured, because “you could turn up just 2, 3, 4, 5 minutes ‘late’ in the morning” and they would tell you “you’re late, we don’t need you - go home”. 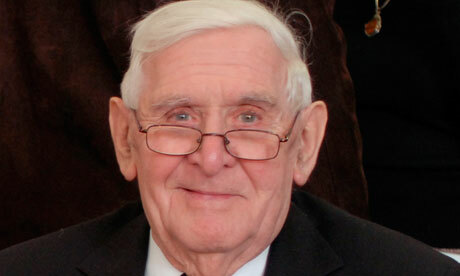 For this reason, Kate’s grandfather decided to become “a gentlemen porter” instead. As the middle man between the wholesale shops and the smaller businesses, he found a job that felt more secure, since he “worked for himself”. My only image of the old Covent Garden market comes from My Fair Lady’s filmic representation. Curious to learn how Kate remembered it, I asked her what it was like. Evocatively, she replied: “It was everywhere”. Kate described how every street was full of shops selling all kinds of different produce. Alongside these, there were also shops specialising in supplying florists with items such as vases, frames for wreaths, moss, or flower wire. 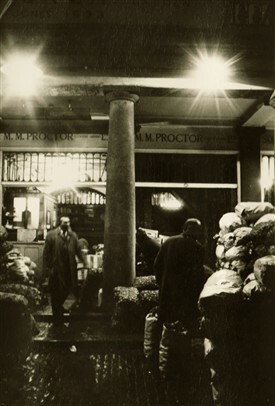 The market started up around 5am in the morning, but there were night workers who worked throughout the night, so the area always had people working. Kate told me how “nuns used to come along with little wheelbarrows” picking up the vegetables and odd potatoes and pieces of fruit that had fallen out of crates and boxes and “were just left lying in the gutter”. The nuns would then pick up “the odds and sods” and take the discarded food away to be cooked at the convents. This reminded Kate of how, in the market, “they used to throw so much away at the end of the day”. She once asked her father why all that unsold fruit was discarded and he explained that it had to be thrown away or customers “will wait till the end of the day and try to buy it cheap”. For Kate, wasting all that food seemed “mad”, but her dad said “that’s how it’s always been”. One of the most fascinating parts of our talk revolved around Kate’s childhood games. 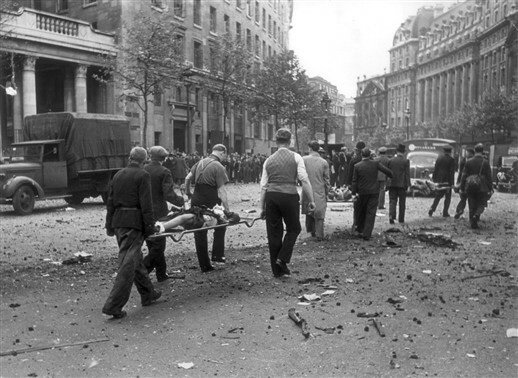 German aerial bombing during the war had left a physical mark in London’s landscape. These “rough open spaces”, as she so accurately described them, had lots of uses when they were growing up. Kate told me how “the local boys used to go round collecting wood and old bits of furniture to burn on bonfire night” while she and her friends would make up a guy and sit outside their flats and ask for “a penny for the guy”, which was particularly fruitful in an area so full of theatre goers. Once they had collected enough they would use the money to buy fireworks to light up in the “grounds” in the flats where they lived. Some of these old bombsites were later turned into gardens which became the centre for May fairs and parties that brought the community together. As “pocket money was short” when Kate was growing up, the local children found ways to get some extra cash to spend. Kate and her friends used to collect old newspapers and rags and go to “a huge waste paper warehouse” by St. Giles Church where a man “would weigh them and you’d get paid”. They also made money by taking back empty lemonade bottles, which were all glass in those days, getting 3d for each one they returned. During the summer the kids would play a game called Canon which consisted in getting together pieces of wood to build something similar to a cricket stump. A team was put together and someone threw a ball at the stumps, breaking them. Then, they would “all go different ways” and each one in the team had to try to return to put the stump back together again while being chased by the other side. This game took place in “the middle of Peabody buildings. 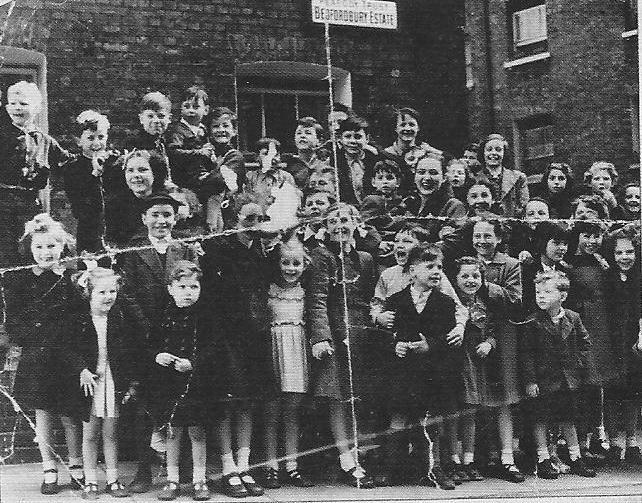 The middle row of flats had been bombed so it left a big open space to play in.” Other games were skipping, “two balls” and making bows and arrows out of the little “bits of wood and bamboo from the ironmongers”. This same bamboo cane was also used as a form of punishment by the nuns at Kate’s local school. “And nobody was ever bothered by this”, she said, “It was a fact of life. You were naughty – you got the cane – there was no question of ‘You can’t do that to me – I know my rights, like the kids today’”. They went for picnics at Lincolns Inn, and they “used to go to the law courts and roll down the hills”. Kate seemed to enjoy remembering how well suited the law courts lawns were to roll down in. When hungry, (usually after swimming at the Oasis) the kids would buy chips from the local fish and chip shop, which is still there today. And if someone couldn’t afford chips, they could buy a bag of “crackling”, which was all the fried “pieces of broken batter from the fish” that were set aside in a tray, and they “just put salt and vinegar” on these pieces and had that instead for “something like a penny”. 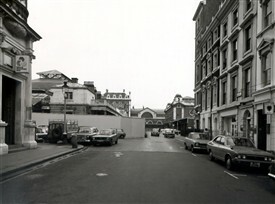 Although barely two generations ago, the Covent Garden Kate describes is unrecognisable today. She told me how “we used to get brilliant fogs in London” where “you couldn’t see a thing - not a thing.” On really foggy nights, her father used to go to pick up her sister who worked at the theatre, to help her find her way home. All this was “exciting if you were young.” Gas lights are also a thing of the past, although there were petitions to keep them going. A man on a bike used to come round in the evening to ignite the lamps with a “great big wooden pole”, and then return in the morning to switch them all off. Older men often found jobs as night-watchmen, staying in a “tent made out of waterproof material” during the night where there was on-going building or road works, to “make sure nobody fell down” and “nothing was stolen”. Theatre life is a fundamental part of the fabric of Covent Garden, and Kate got a chance to experience it at its fullest. She sees this as one of the main benefits of living in the area, since you “always had a friend who worked in the theatre”, as she still does today. Kate remembers “bunking in” to see Beyond the Fringe. She took her daughter to see (amongst other shows) Vanessa Redgrave in The Taming of the Shrew, and once her brother got to see Frank Sinatra at Drury Lane by giving the “doorman a fiver to let him in”. When they were bored, or simply felt like watching a play or a show, they “would often bunk in”, trying the side doors to the theatres to see if they were open, and then “creeping up the back stairs, to get in”. Kate also worked in the theatre, in the bars and as an usherette, to get enough money to go on vacation for the summer. She remembers serving “trays of coffee” to audiences at the interval. By the 70’s, when the GLC published a development plan that would transform the Covent Garden Kate had grown up in, she did not have much of a chance to get very involved in the local campaign fighting against the plan because in 1973 she was pregnant. 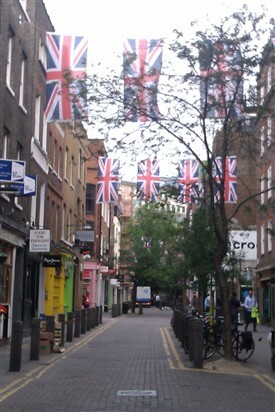 Kate did take part in some demonstrations and was against the GLC’s vision for Covent Garden. She saw how people were being moved out to start pulling buildings down and rebuilding, and she joined demonstrations after she learned that the new buildings, which they thought would be public housing, were going “to be sold off”. Kate also witnessed the closing of the fruit and vegetable market. When I asked her how she felt about that change, she said: “I hate it. I’d much rather it was like it was. This market now is sort of soulless.” Although Kate feels the campaign in the 70’s managed to save Covent Garden, since the result is “far better than the original plans”, she does not like Covent Garden as it is today. “There are fewer schools, there is a lot more traffic, it’s always really busy 24/7 and funnily enough, it’s dirtier”. But in spite of this, she firmly reminds me, she “would never move”. After having the chance to get to talk to her, I feel I understand why. This interview was conducted as part of the Lottery Heritage Fund project, ‘Gentleman We’ve Had Enough: The Story of the Battle to Save Covent Garden’. 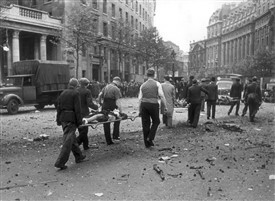 On Friday 10 May 2013, King’s College London students, supported by Westminster Archives, the Covent Garden Community Association, and the Centre for Life-Writing Research at King’s College London, interviewed Covent Garden residents about their memories of the area. Students’ accounts of their interviews have been added to this Covent Garden Memories website. For more information, see: www.kcl.ac.uk/artshums/ahri/centres/lifewriting/gentlemen.aspx. This page was added by Barbara Gallego Larrarte on 08/07/2013.